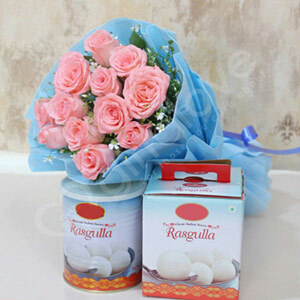 Home » Flowers with Sweets » Pretty Rose with Sweet Delight! Wrapping materials of the bouquet can be used again for decorations. The green fillers as shown in the image are used in the bouquet as per its seasonal availability. Mostly, all the species of the flower bears five petals, but Rosa sericea species of rose bears only four petals. Pink Roses signify joy, gratitude, endless love, and admiration. 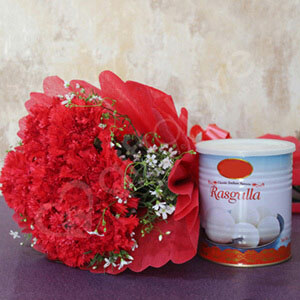 Winning heart of someone very dear or near is easy with this wonderful flowers and sweet combo that is an excellent gift option to make. Be it anniversary, housewarming, birthday, Mother"s Day or any other special moment of the year, this is definitely the best gift option to make choice for. So place your order today! !